Remembered above all for his role as Ralph Kramden – the boisterous, rotund, crude yet lovable bus driver on The Honeymooners with get-rich-quick schemes aplenty – Jackie Gleason was born into a cash-strapped Brooklyn family in 1916. He attended Bushwick High School and in his teens found an audience for his routines in pool halls and school plays. Later he worked as a barker for carnivals and performed in clubs. Already in the 1930s he was seen on Broadway in the burlesque revue Hellzapoppin’, and in 1940 he had a number of skits in the revue Keep off the Grass. Soon afterward he found work in film, often playing a thug. Among his numerous early movies were Navy Blues (1941); All Through the Night (1941), in which he played alongside Humphrey Bogart and Peter Lorre; and Larceny Inc. (1942), opposite Edward G. Robinson. He returned to Broadway in 1943 for the revue Artists and Models and, the following year, had a prominent role in the musical Follow the Girls, in which Gleason’s character performs in drag. At the end of the decade, he took part in another Broadway revue, Along Fifth Avenue (1949). Also in 1949, Gleason got his first major television role, starring in The Life of Riley, which already had a following as a radio series. Although he was soon replaced by William Bendix, who had starred in the radio version of Riley, Gleason was chosen in 1950 to host Cavalcade of Stars, a variety show that eventually became The Jackie Gleason Show. 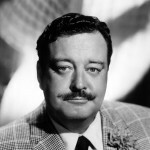 In his early broadcasts, Gleason introduced characters that would recur in later years, and four of those characters eventually found a home on their own show – The Honeymooners (1955–56), the classic sitcom that Gleason will always be associated with. As Ralph Kramden, Gleason played a poor Brooklyn bus driver with grand schemes for a better life – inevitably frustrated by harsh realities. Performed in real time, the show was fast-paced, with costars Art Carney, Audrey Meadows, and Joyce Randolph creating the perfect comic chemistry. Returning to Broadway one last time for his greatest success there, Gleason starred as Sid Davis in Bob Merrill’s comic musical Take Me Along (1959), based on Eugene O’Neill’s play Ah, Wilderness. For his performance – preserved on the original Broadway cast recording – Gleason received a Tony Award ® for Best Actor in a Musical. Though Gleason did not read music, he had a good ear and was able to compose a number of tunes with the help of skilled musicians. From the early 1950s to the early 1970s, he worked on a large number of mood-music records. In his later career, Gleason hosted several variety shows and appeared in a number of films. Among his most memorable movie roles are those of pool shark Minnesota Fats in The Hustler (1961), which also starred Paul Newman, George C. Scott, and Piper Laurie; the title role in Gigot (1962), a film for which Gleason also wrote the script and the music; and the sheriff in the Smokey and the Bandit films, starring Burt Reynolds. Gleason died in Florida in 1987.